DIY homemade cleaners have become all the rage online, everywhere from Pinterest to Green Cleaning Blogs. They often promise cost savings, greater safety, and better results than store-bought cleaners. Consumers are eager to believe because, well, who doesn’t want to save money and keep their family safe, right? However, as we’re about to reveal, cleaning your home effectively takes real science, and there are many occasions where it’s cheaper and healthier to leave cleaning chemistry to the experts! MYTH #1 Store-bought cleaners are easy to replicate at home. FALSE Thanks to the convenience of store-bought soaps, few people comprehend the complex chemistry that goes into making them. Quality cleaning chemicals are sophisticated formulations that include surfactants (which make oil and dirt mix in water), chelating agents (trap tap-water minerals so they don’t interfere with a soap’s chemistry), builders (bind tap-water minerals and help to emulsify oils in water), solvents (such as paint thinner to dissolve specific soils), oxidizers (add oxygen to remove color from soils), and preservatives (prevent degradation of the formula before use). All of these elements are carefully selected for cleaning specific dirts from specific types of surfaces. The chemicals must be added in specific orders, ratios, and at specific temperatures to keep all the elements from interacting with and destroying each other. There is simply no way to pull this off in your kitchen, even with your kid’s chemistry set! MYTH #2 Homemade cleaners are just as effective as store-bought ones. FALSE Since homemade cleaner cooks can’t set up factory-quality labs at home, they rely on far simpler formulas to make their soaps. These simpler formulas cannot effectively clean complex soils and are often only one-hit wonders. For example, they might contain an acid such as vinegar to dissolve hard-water stains, but lack surfactants or builders to deal with oily soils and tap-water minerals. When a DIYer tries to clean something complex such as soap scum, they are only breaking up part of the dirt—they’re scrubbing off the rest with pure elbow grease! One-hit wonder recipes are also highly unstable (like combining vinegar and baking soda—more on that below); they don’t last after being mixed, so they can’t be stored. Over time, poor-performing DIY cleaners force you to use increasingly abrasive and exhausting scrubbing to get things clean. That puts wear and tear on both your shoulders and the surfaces you’re trying to maintain! 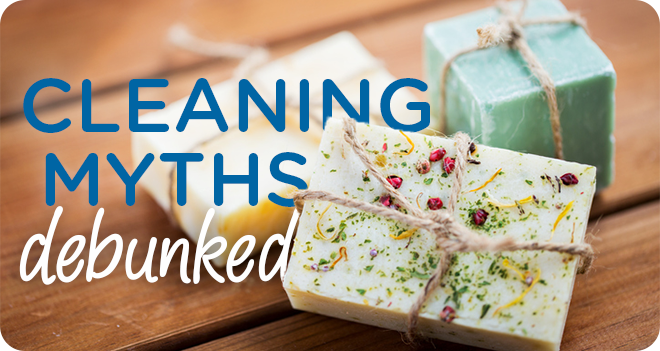 MYTH #3 Cleaner recipes on blogs or Pinterest boards must be good if they’re popular. FALSE Unless a blog starts with “I have a master’s degree in chemistry,” keep clicking! There are a HUGE number of useless formulas running around online written by people who have no idea what they are actually making! Key example: If any blog or Pinterest board includes a formula that tells you to combine vinegar with baking soda and then to store the solution for later use, leave the page immediately. Acetic Acid 5% (vinegar) and sodium bicarbonate (baking soda) react instantly, making fizzy carbon dioxide bubbles. But, when the fizzing stops, you’re left with only diluted sodium acetate (basically, salt water). Sure, the fizzing might loosen up some dirt if you use it right away, but if you’re storing the mixture for later use, you’re really just entertaining yourself with a 5th grade volcano experiment that smells of lavender! MYTH #4 If the homemade cleaner recipe online has lots of good reviews, it must work. FALSE Everyone loves good cleaning theater. Ever wonder why all window cleaners are blue? It’s to make you believe they streak less. If the recipe makes lots of fizzing or lathery bubbles or smells potent, people tend to believe it’s working far better than it really is. Also, almost all DIY recipes start with a bit of real effectiveness, such as a laboratory-made dish soap or vinegar, which can dissolve some minerals. Seeing DIY cleaners work a little plus the theater aspect is enough to sway plenty of online reviews. In most such recipes, the dish soap is doing all the work because (drumroll, please) it was made by chemists in a controlled laboratory. MYTH #5 There is NEVER a good reason to use homemade cleaners. FALSE While for regular cleaning it’s best to leave the work of creating quality formulations to real chemists, there are a few occasions where DIY products make sense. The biggest one is when you’re cleaning in a pinch—when you need to clean it NOW and don’t have the right product on hand. Mixing what you DO have according to recipes found on trustworthy websites can save the day. For example, let’s say you run out of silver polish just when your mother-in-law will soon be arriving for dinner and you want to use the silver utensils she gave you. You can soak the utensils in a glass casserole dish lined with aluminum foil and filled with a solution of water and baking soda (at a ratio of one gallon to one cup). It’s not as good as the real thing, but you’ll get dinner on the table on time without embarrassing yourself. When going the DIY route, stick to the websites of cleaning solution manufacturers or of reputable home-improvement magazines that usually use qualified fact checkers to verify their recipes before they publish.